Mindful Eating Support Community - Am I Hungry?Am I Hungry? We recognize that you are all in different places in this process so we created three different levels to meet your specific needs. So whether you are brand new to mindful eating or simply working on integrating these powerful concepts into your life, you will find a level that is perfect for you! 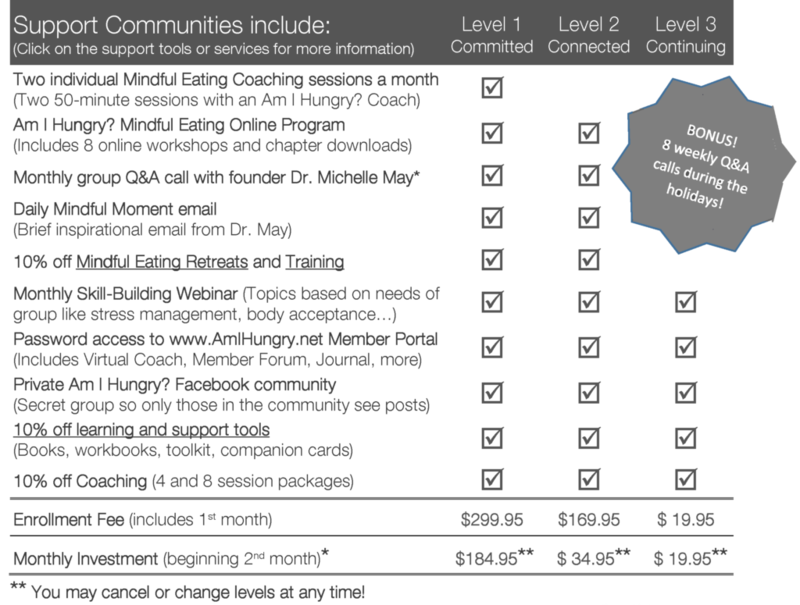 What is included in the Mindful Eating Support Community? Using the most creative and efficient way to learn, these eight interactive online workshops and Eat What You Love, Love What You Eat chapter downloads will guide you through the Mindful Eating Cycle step-by-step! how to build a great big life you love! During this monthly one-hour group call, we will answer your questions and help you sort through the challenges that keep you stuck. You can ask your questions live or send them in advance. You’ll also learn vicariously from the challenges other community members are facing. In addition to all of the essential topics that are already part of our Mindful Eating Program, we’ll choose an additional topic for a deep dive with the Community each month. These topics will be designed to build your skills and will be chosen based on the challenges community members share, such as stress management, body acceptance, managing your emotions, and so on. You will have access to a private Support Community with others who “get you” because they are struggling with similar issues. In addition to the wisdom and support you’ll receive from other Community members, do our best to guide you through this process. Depending on the most convenient option for you, you can use our password protected Member Forum and/or our new “secret” Mindful Eating Support Community Facebook group. For privacy, only those who are currently in the Community will be able to see and respond to your posts. 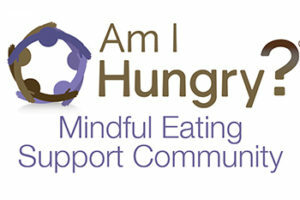 Working one-on-one with a Mindful Eating Coach can accelerate your progress and help you apply the Am I Hungry? principles to transform your life. Depending on which Support Community Level you choose, you’ll get either two 50-minute sessions each month with an Am I Hungry? Mindful Eating Coach, or 10% off any Coaching package. You’ll have our Mindful Eating Virtual Coach, a private journal, inspirational emails, and other support tools at your fingertips! Community members also get 10% off of our books, workbooks, toolkits, and companion cards. Levels 1 and 2 receive 10% off any of our Retreats and Training–a savings that quickly pays for your membership! Level 1 is our highest level of support. This level is for you if you are committed to resolving your eating challenges and building a positive relationship with food and want the support of a personal Mindful Eating Coach to guide you through the process. In addition to everything included in Level 2, Level 1 features two private one-on-one sessions with an Am I Hungry? Mindful Eating Coach each month. BONUS 30-minute coaching session in your first month! Level 2 is perfect if you are new to the Am I Hungry? mindful eating approach, or need a refresher. It features our new online Mindful Eating Program which lays the essential foundation you need using our proprietary Mindful Eating Cycle (includes 8 online workshops and Eat What You Love, Love What You Eat chapter downloads). Levels 1 and 2 also provide a monthly group Q&A call with founder, Dr. Michelle May and a monthly skill-building webinar to help you address your most difficult eating challenges. All levels provide you with a connection to others so you can practice your new skills in a supportive community.